Piece together the mystery of the manor. Solve the empty safe mystery. Click and make pairs from the left or the right wing. You can only choose a tile with at least one free edge on the left or right. Sit back and enjoy the classic mahjong game with the cutest tiles! The scientists from the Netbots Science Lab need your help! Challenging puzzle game with well balanced levels and a motivating storyline. Your goal is to help green and red cyclops get to their corresponding platforms. A Box can transform into a ball, a ball can transform into a box. Awesome and greatly addictive free marble popper with thrilling zombie-themed graphics, three game modes, a plenty of skill levels as well as a variety of bonuses. 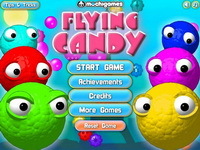 This fun game is really fast-paced and challenging and requires both planning ahead and quick hand-eye coordination. Shoot at three or more beads of the same color to delete them all in the Arcade game mode. The Puzzle mode needs thorough sight as the number of shooting beads is limited.